The press release for Basque artist Asier Mendizabal’s show at Raven Row (his largest outside of Spain to date) indicates the artist’s interest in ‘the symbols through which cultures are represented’, an innocuous but relatively banal characterisation of his investigation into the visual codes of collective life and identity. This description fails to indicate how elegantly he explores how ideology, belief and identity are simultaneously abstracted and made real in the process of being given visual form. And while Mendizabal’s practice is grounded in very thorough research, his engagement with the process of making ideology visible is not esoteric or dry – it does not adhere to any supposed split between intellectual reference and aesthetic form. Mendizabal successfully works with a variety of media and techniques to create compelling, often beautiful, objects and images; in addition, he provides explanatory texts (also beautifully designed) at two points in the exhibition. The dynamic balance of ‘form’ and ‘content’ in Mendizabal’s practice, and in the Raven Row exhibition, is crucial. It amounts to a very direct use of, and engagement with, the same processes the artist explores. 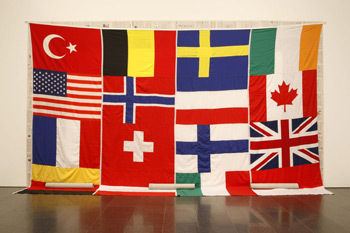 The piece ‘Bigger than a Cult, Smaller than a Mass (One, Two Backdrops)’ (2006), a tapestry of national flags stitched together and hung in front of a collage of newspapers mounted on the wall, invites questioning of how a specific ordering of lines and colours (which looks increasingly arbitrary when juxtaposed with other examples) becomes a ‘flag’ that can be read as a nation. The form of a flag is only legible because of a prior and concurrent process of knowledge exchange, even if it is one that takes place almost automatically. Mendizabal disrupts this syncronisation by stitching the flags together in an apparently meaningless constellation, and thus proves that ‘form’ and ‘content’ together give an image ideological meaning. This might seem like quite an obvious point, but Mendizabal’s work expresses it with restraint, engaging in the very dynamic he investigates. Mendizabal interrupts the assumptions that enable cultures and beliefs to be represented visually (he detaches the signs from what they signify) and so proves that this process of making assumptions and identifying with them is assimilated rather than automatic. Mendizabal’s recent work ‘A Letter Arrives at its Destination’ is presented as key to the exhibition and to Mendizabal’s practice over the last five years. Mendizabal has translated a 1953 letter from the Basque sculptor Jorge Oteiza, addressed to the jury of an ICA competition to select a monument to the Unknown Political Prisoner. Oteiza’s entry into the competition was shortlisted by not selected, and in this letter (which was never actually sent to the jury) Oteiza explores the relationship between abstraction and political belief, protesting the ‘superficiality of an abstract art that is insufficiently experimental’. This frustrated protest came at a historical moment when the Western art world was making a political maneuver in the cultural Cold War toward abstraction, which was made to represent a modernity ostensibly beyond politics. Mendizabal’s text-based work delivers this letter to London more than half a century late, printing it interspersed with oblique historical contextualisation and images of Oteiza’s submission to the competition. ‘A Letter Arrives at its Destination’ is provided as a pamphlet for visitors and also displayed unfolded on a table, so that the text and images are broken out of sequence and abstracted to the point that the narrative takes on a physical presence rather than an informational one. You walk around the text in the same way you walk around one of Mendizabal’s sculptures. Another pamphlet, ‘Otxarkoaga/Targu Jiu/Hernani’, gives some background historical information for three pieces in Raven Row’s large ground floor gallery. This information has a supplementary function rather than a drily explanatory one – reading the text and then looking back at the work adds to its meaning rather than changing it entirely. 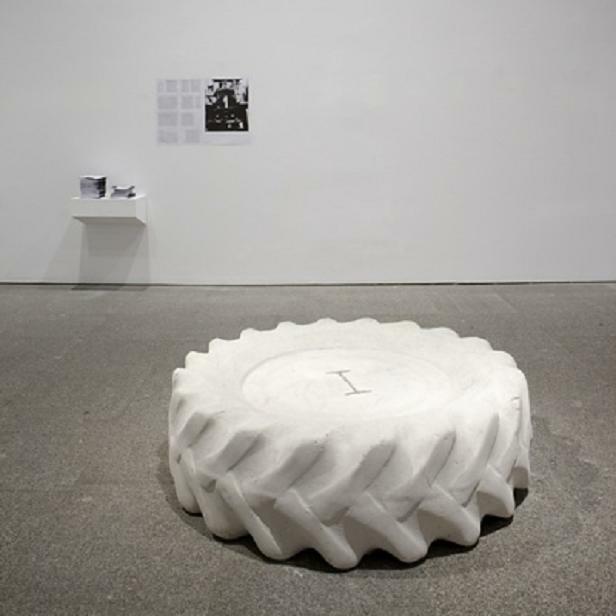 ‘Untitled (Targu Jiu)’ is a concrete sculpture of a large tyre; the visual surprise of an unexpected material applied to a familiar object radically removes it from any function or use beyond sculptural presence, even if the concrete looks implausibly yielding, its surface worn and stretched in places like rubber. Put simply: this is an interesting sculpture; it provides a compelling aesthetic experience. But the pamphlet then also suggests that ‘Untitled (Targu Jiu)’ is part of a larger narrative related to Constantin Brancusi’s famous monumental sculpture, ‘Endless Column’, in Targu Jiu, Romania (now the tyre treads begin to look like the diagonal forms that make up ‘Endless Column’) and the attempts to destroy it with a tractor in the communist period. This information does not detract from the initial experience of encountering the sculpture, it contributes to it – rather than constraining the viewer to see the sculpture in a particular way, it opens up the sculpture to more meanings and viewings. This dynamic of looking, reading and then looking differently contributes to Mendizabal’s larger project of exploring how symbols, meant to function immediately, only have significantly mediated and contingent meanings via a more or less willed process. It is not that symbols are meaningless or unintelligible so much as they are potentially meaningful – we can read them as other things. The Raven Row exhibition has sensitively presented a selection of Mendizabal’s work, foregrounding the insistent ambiguity and variation at the heart of his practice without surrendering either to incoherence or oversimplification. For more info, visit the Raven Row website.